More skimming the surface of Planet Jazz this time with a look at New York-based saxophonist Chris Potter’s 2001 Verve debut Gratitude. I only encountered the album for the first time in January, but reading contemporaneous reviews it is clear that Gratitude was received both as an instant jazz landmark and a comprehensive confirmation of Potter’s remarkable talent at the time of its release. Listening in 2018 it sounds like a modern classic, drawing both on the influence of the post-bebop masters like Coltrane and Rollins, but also owing much to Potter’s gift for crystalline melodies and appealingly knotty (but never too knotty) structures. Although I only heard Gratitude recently, my first exposure to Potter was in 2000 when he contributed a series of astonishing solos to Two Against Nature, Steely Dan’s first album after a two-decade studio hiatus. His performance on final track ‘West of Hollywood’ was particularly impressive as he essentially closes out the track with nearly four minutes of soloing that is infectiously swinging, melodic and inventive over a trademark ‘Dan complex chord sequence. Despite his obvious phenomenal technical skill, there is also a shifting textural quality and occasional sense of vulnerability to Potter’s playing that renders it constantly fascinating. He is, you sense, always thinking about the meaning of the song and the broader sonic thrust of the track, so his playing is never in danger of overwhelming a piece – rather, it is integral to it, and in service of the overall emotional impact upon the listener. Continuing involvement with Steely Dan over the next few years would see Potter’s profile rise higher, but it wasn’t too long before he refocused on solo work and began to amass a fine body of work that moves within recognisable post-bebop circles but also adds a freshness and lightness of touch that is unique to Potter. Beautifully and crisply recorded, Gratitude is a brilliant entry point to his work, featuring 13 tracks inspired by and dedicated to jazz sax greats including the aforementioned Collins and Rollins, as well as Ornette Coleman, Eddie Harris, Wayne Shorter, Charlie Parker and Lester Young. But above all, there are the tunes and so many of them are captivatingly infectious. ‘Trane-dedicated opener ‘The Source’ features a gorgeous central theme, immensely evocative of jazz’s late ‘50s/early ‘60s smoky club heyday; ‘Sun King’, for Rollins, is based around an effervescent melody and some of the most exciting ensemble playing on the album; and ‘High Noon’, for Harris, is supremely funky, founded on intricate Fender Rhodes from keyboardist Kevin Hays. Hays is part of a set quartet throughout this album that is simply superb. On bass is Scott Colley, whilst drummer Brian Blade is one of my favourite modern players. Always taking musical risks but more often that not locked into a brilliantly hefty groove, Blade first came to my attention with his extraordinary performances on Joni Mitchell’s Taming the Tiger in 1998 (check out the track ‘Lead Balloon’ – not one of Mitchell’s best songs by a long way, but Blade’s playing is breathtaking). One of the most prolific artists of his generation, Blade remains hugely active as a sideman (Redman, Norah Jones, Daniel Lanois, Wayne Shorter et al), co-leader (with Ron Miles, Bill Frisell, Chick Corea, Christian McBride etc) and leader. 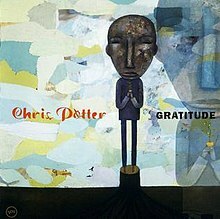 Superlative Potter releases since Gratitude include Travelling Mercies (2002), Transatlantic (2011, with the DR Big Band) and – since he began a new relationship with ECM in 2013 – the orchestrally-tinged Imaginary Cities (2015) and the more conventionally-conceived The Dreamer Is the Dream (2017) with a fine quartet featuring bassist Joe Martin, Cuban-American pianist David Virelles and drummer Marcus Gilmore. In recent years, he has also been a key member of Pat Metheny’s Unity Group, arguably the most inspired of Metheny’s many bands and certainly his most musically ambitious. As ever, Potter’s contributions are within the tradition but propelled by a very contemporary-sounding sense of perpetual motion. Complementing Potter’s amazing talent as a player is his strength as a composer, which is perhaps rivalled only by Joshua Redman among his generation of sax players. Harmonically complex but melodically often appealingly straightforward, his tunes frequently feel like instant standards; the kind of jazz melodies you feel you have known all of your listening life. It’s an impressive artistic trajectory and one that is very much ongoing, but it was with Gratitude that he first began to cement his position as one of the true modern greats. Some bands are simply never ‘in fashion’, even during the period of their initial emergence. They do not fit into an obvious trend or movement, or even chime with a specific moment in the cultural zeitgeist. Often shorn of any obvious ‘image’ (or desire to have one), they must rely instead on their songwriting and instrumental chops – and the years and years of hard graft that is invariably required to build a substantial following outside of mainstream media exposure. And sometimes, despite everything, that following may still be limited primarily to one geographical region. One such group is Phish, which emerged from the early ‘90s US ‘jam band’ culture that resonated with audiences who had flocked to the Grateful Dead during their 1980s resurgence as one of the world’s most successful live acts. Always a touring workhorse even at their lowest artistic points, the Dead’s status as counter-cultural icons seemed to strengthen dramatically in the early ‘80s – possibly as an entirely logical response to the prevailing me-me-me, ra-ra-Ronnie (Reagan) political and social ethos of the day. By the latter part of the decade, Dead gigs were no longer just that – against the band’s wishes they had turned into huge ‘gatherings of the tribes’ that were habitually overrun by ticket-less fans and subject to all manner of unofficial peripheral activity that the Dead themselves were powerless to stop. It became a financial and logistical nightmare, and there is little doubt that the resulting stresses contributed to the premature demise of guitarist and bandleader Jerry Garcia in 1995. Musically and philosophically, there was a large space left unoccupied by the Dead’s decision to terminate activities after Garcia’s death. More than any other band, Phish have proven to be the Dead’s natural successors, although in many respects they have been far more consistent than their forerunners. Line-up is one obvious example; whereas the Dead was subject to numerous personnel changes over the years, the Phish quartet of Trey Anastasio (guitars/lead vocals), Page McConnell (keyboards), Mike Gordon (bass) and Jon Fishman (drums) has remained unaltered for well over two decades now. Similarly to the Dead, the Phish phenomenon is based around a remarkable and ever-growing reputation as a live act. Songs that were relatively compact on record frequently take on new, elongated forms through extended instrumental interplay and amalgamation into unexpected medleys and protracted jams. Reading that last sentence back it may sound like this could be the worst music imaginable, and Phish undoubtedly have their moments of rather aimless experimentation and cul-de-sac soloing. But they also generate countless transcendent passages and, even in the less inspired moments, Phish music almost invariably exudes a sense of joy and shared experience between the players – underlining the fact that, by all accounts, they remain close friends (…and how many groups can claim that after decades of extensive touring?). Like Garcia, Anastasio has had his share of substance abuse issues, and these contributed to the band splitting up in 2004. But unlike Garcia, Anastasio managed to clean up permanently and has now been drug and drink free since an arrest led to his enrolment in the US drug court programme in 2006 (he has since become an eloquent advocate for the scheme, which he believes saved his life). In the wake of his recovery, Phish reformed in 2009 and has been touring every year since, winning some of the most ecstatic notices of its career – especially in the last 2-3 years. The band themselves appear to be enjoying stage work hugely, with Anastasio in particular playing and singing better than ever before. In recent years they have developed a firm relationship with New York’s Madison Square Gardens – they played 17 shows there in 2017 alone – while Anastasio also took the Garcia spot a few years back for the remaining Dead members’ reunion/farewell shows in a pleasing ‘completion of the circle’. American Beauty and Workingman’s Dead aside, it is often argued that the Dead made few definitive studio albums, being intrinsically more receptive to the flashes of inspiration that occur on stage than the arduous take-after-take methodologies of the studio. Phish’s own studio catalogue is uneven too, with only Billy Breathes – an appealingly streamlined collection with a handful of classic songs, including the gorgeous title track – standing out from their 1990s catalogue. But since their late ‘00s reformation their studio work has become significantly more consistent, with all four members contributing more equally to the songwriting – although Anastasio remains the dominant writer. This must be partly attributable to the happier headspace the four members now find themselves in, both individually and collectively, but their decision to hire Bob Ezrin as producer for the last few albums has also brought a welcome sense of focus. Ezrin is – how shall we put it? – someone with a reputation for assertiveness, speaking his mind and other related cliches. Although a musician in his own right who has contributed keyboards to many of the records on which he has worked, Ezrin’s forte is – by general agreement – his capacity to bring coherence and artistic discipline to a project that may be in danger of floundering on the contrasting opinions of the band members. Exhibit A here is Pink Floyd’s 1979 double LP The Wall, which was recorded during a period of growing divisions between Roger Waters, David Gilmour and Rick Wright. Ezrin brought clarity to Waters’ vision and also encouraged the band to embrace more concise arrangements and contemporary-sounding production. The result is – along with Wish You Were and, of course, The Dark Side of the Moon – one of their enduring masterpieces. Interviews with Phish members indicate that Ezrin has contributed a similar sense of urgency – and, in particular, a focus on ensuring that no sub-par material reaches record and that every song included is there for a good reason – to the two albums he has made with them so far, 2014’s Fuego and 2016’s Big Boat, of which I would argue the former is perhaps Phish’s finest studio release to date. The album is certainly one of the band’s most diverse, embracing multi-part rock epics (the title track), relatively straightforward pop (‘Sing Monica’), horn-enhanced funk (‘Wombat’), and soulful balladeering (‘Waiting All Night’). It is also surely no coincidence that the band is at its most Floydian on the closing ‘Wingsuit’, which is a gorgeously-structured piece that culminates in a stunning solo from Anastasio. As one would expect from an Ezrin production, the entire album is beautifully recorded and as such fully captures the push-and-pull interplay between the four members (most of the basic tracks were cut live in the studio). Although the band goes from strength to strength commercially in the US, they could hardly even be described as a cult act elsewhere, and regrettably they have not toured Europe for many years. Much as it pains me to say, I fear that their minimal impact on UK listeners is due to a suspicion of great instrumentalists that has affected rock and pop here since the advent of punk. ‘Rip up the rule book and start again’ can be a terrific maxim, and it certainly had its value as a riposte to the more bloated excesses of ‘70s prog. But one of its enduring tenets – that you don’t need to actually be able to play an instrument properly and that this can actually be a hindrance to creativity (or some such B-S) – is truly regrettable, and its legacy can be felt in successive generations of poorly conceived albums that owe little to individual ability and everything to expertise with computer recording software and producer or programmer-driven ‘fixes’. Phish are unabashedly brilliant players who believe that practice, practice and more practice can contribute immeasurably to their music, whether live or in the studio; their interviews are littered with references to rising early in the morning to get to grips with new pieces or find exciting new shapes in old ones. It’s hard to imagine a more unfashionable approach these days, but The Uneasy Listener is nothing if it’s not about the endorsement of the awkward. Phish music takes a while to seep into the sub-conscious, but after a few years of intensive listening it’s difficult to imagine my musical life without them. 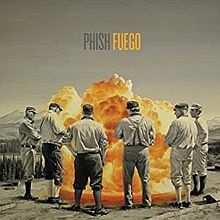 Fuego is a fine starting point for the uninitiated, and if that whets the appetite there are many hours of sublime live performances that Phish have kindly documented on their own YouTube channel. Just check out recent clips of epics including ‘Chalk Dust Torture’ and ‘Carini’ for proof of their present fiery form.